Bathtime has never been simpler with these lovely paraben free all-in-one body cleansers. Original chamomile fragrance is a lovely soothing wash perfect for any time of the day. 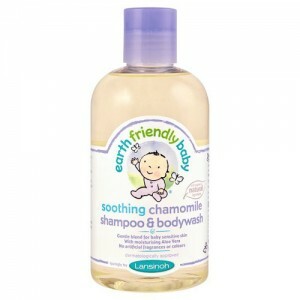 SLS free gentle baby wash with soothing chamomile. Bathtime has never been simpler with these lovely paraben free all-in-one body cleansers. Head and shoulders, knees and toes...whoopee! This delightful Shampoo & Bodywash with natural chamomile has been specially created to cleanse Baby's delicate hair and skin without leaving behind residue. Chamomile was specially chosen as an ingredient in all three because it has been used for centuries for its gentle healing properties - ideal for babies! In Spain, Chamomile ('manzanilla' - little apple - because of its apple-y scent) is used by women as a hair rinse to accentuate natural highlights. 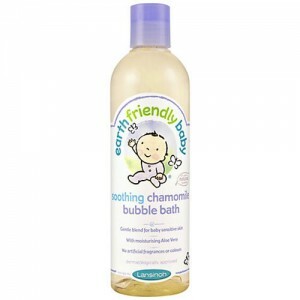 Earth Friendly Baby has added more organic plant oils to improve the skin cleansing effect and give a sweet yet refreshing scent. It must be working because more and more health conscious mums and babies are making these Paraben Free all-in-one shampoo and bodywashes their preferred choice!